One of my favorite parts about Sea Otter is getting to meet all the people and sponsors that support our Devo team. We get to see some behind the seans things and up and coming ideas and we get to ask them questions and give them feedback on their products. The best part is getting to do it with the rest of the Devo team. The cross country course was completely different this year than the past few years. We started the race going up the climb on the actual raceway and into the Pro and E-bike courses earlier in the week then back on to the raceway and going up the other side of the track up the corkscrew. After that, we headed out on the trails going the opposite direction that we had gone for the past few years. 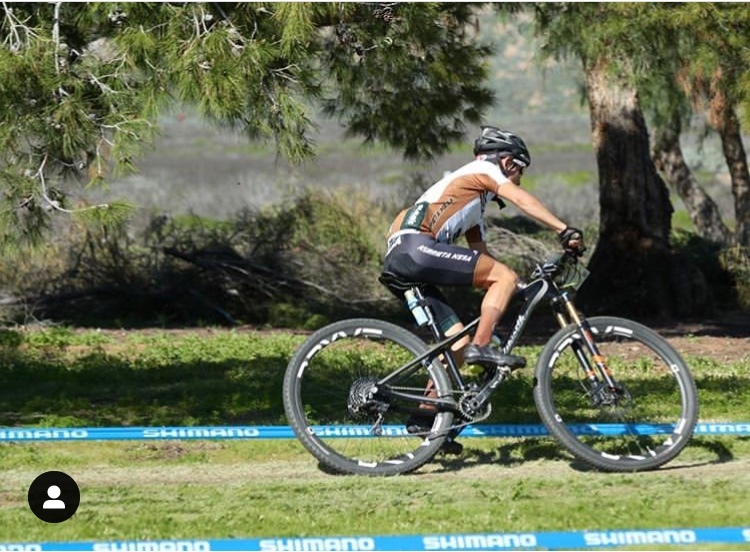 This start was by far one of the hardest starts I have ever done at Sea Otter. Right off the gun, you went into three incredibly steep hills that were not at all short. One climb after the other, in grueling pain, trying to stay with the guys in front of me and catching my breath on the descent, realizing by the top of the last of the three pitches that I had only gone 2 or 3 miles and I still had 23 miles to go. By this time the whole field was totally split up and I didn't know how many people were in front of me or behind me I just started to make efforts to catch other riders. 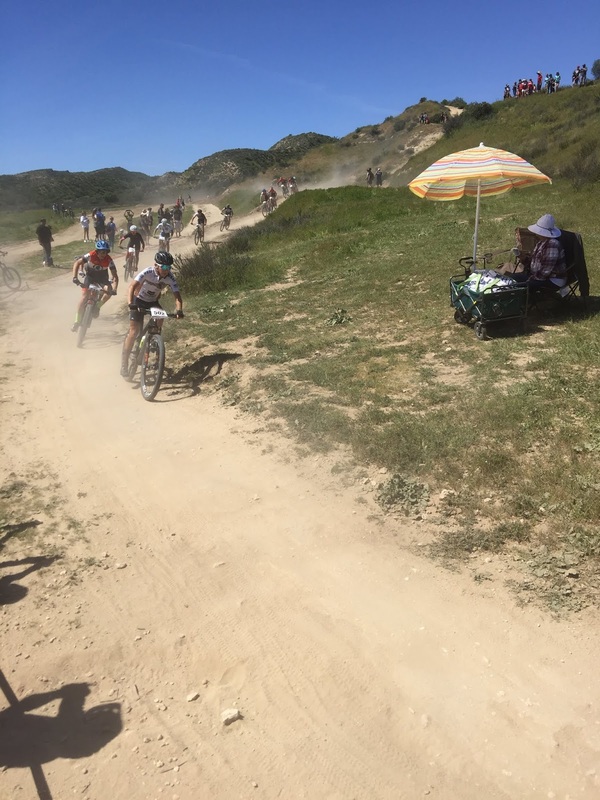 I caught up to a group of three guys, one of them being my teammate on the SoCal Devo team, and stayed right behind them until I was able to make my way to the front of them and work with my teammate. A few miles later we caught another one on my Devo teammates who, little did we know had just had a mechanical. Now there were three SoCal Devo riders in our group of five riders giving us all a strong advantage over the other 2 people in our group. Another rider ended up catching us from behind and attacking up a climb to get into the single track first. I attacked with him from the middle of the group and got into the decent in second position. For me going into a decent I like to be either first or second going into a decent so there is no chance on the lead guy getting away from me. when we got to the bottom of the decent me and the rider that made the attack had a little bit of a gap on the group behind us and we opened it up a bit more on the next climb. I was determined not to let him get away from me for the rest of the race. A few times he got a small gap that I quickly closed. The next section of the course we went down a gravel fire road off-camber steep descent into a steep climb to a fast almost flat, single track decent. On the climb up I wasn't able to stay with him and I couldn't catch back up to him on the descent. Another rider from the group I was in during the beginning of the race caught me and got ahead by just a little bit. I caught up to him later in the race and one of my teammates and another rider from the first group I was in caught up to us so it was the four of us. The next part of the course was probably the most grueling other than the start. It was an extremely steep, long climb that seemed to take forever. I broke away from the guys that I was with on that climb and put a decent gap on them. 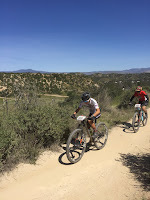 Only one of them, My teammate, was able to close the gap at all on the decent and he almost caught all the way up to me but I had just a few seconds on him when I hit the long fire road climb out. I could see the other rider that dropped me a while ago up the road with another rider drafting on him. I settled into a strong TT pace and my teammate wasn't able to hold on. I cough up to them and caught my breath for a second then quickly got the three of us organized in a TTT and we were going 21 miles an hour consistently up the hill. At the one point of the climb where it got a little bit steeper the three of us split up and I was in the middle. By the time we got back on the raceway, I could see the other rider a little ways up the track. I made a long-shot attempt to try to catch him and ended up coming just a little short. I took 14th place with my teammate right behind me with 15th. Thank you to all my sponsors for the support, Kenda, Rudy, Scicon, Phyisiophix, Ellsworth, Gup, ESI, Canari and Dryve. The third weekend in a row out at Vail Lake and looking forward to a different venue in a few weeks. This weekend though it was a lot hotter and dustier than the previous weekends which means a different type of preparation consisting of a lot of water. My family wasn’t able to camp this weekend due to my dad being at work so I had to drive from home the day of the race. Luckily I live only 20 minutes from Vail so I didn’t have to get up too early in the morning, but I still had to do all the preparation the night before. When I woke up in the morning I was feeling sick so I was a little nervous for my race later in the day. I got to the race venue in the morning and found me a chair and sat there with my water in hand for several hours in the team pit watching my teammates race the whole morning waiting for my race. At about 12 I started getting all my feed bottles with Physiophix to the feed zone and went the the car to get my gear all together. At about 12:45 I started my warm up which I did on the dirt rather than the stationary trainer which is different than what I usually do. By the time I was done with my warmup it was time to get set up in staging. I was the 8th call up and lined up on the second row. Go! The race was on and we were charging towards the first single track all together. We got threw there and up the next climb all together and by half way through the first lap I was surprised to see that majority of the group was still all together. The whole race, people were fighting for position boxing each other out getting aggressive trying not to go down. Going by on the second lap I grabbed my feed bottle but missed my bottle I was supposed to dump on myself. I looked back and there was still a lot of guys behind me but I knew going into the first single track that there was going to be an attack that would break us up. I knew I was too far back in the group to be able to react and I knew I was but it was too late for me to move up in the group. Sure enough the attack went and I was too far back behind a couple people that didn’t even try to go with the attack and I had to fight around them and try to catch a couple other of the stragglers to work with them to catch back up to the lead group. I cought a few of them and we worked together but never cought the lead group. The rest of the lap the three of us worked together to keep the people behind us there and trying to gain on the people in front of us. At the start of the next lap we were all hurting and trying to stay with it to not get cought. Nothing exciting happened that lap exept a lot of pain. The last lap on the other hand was really tough and full of attacks from every person all trying to get that little edge to get away. Every little attack, every climb was excruciating and it was all I could do to stay with the other rider. I got through a couple of the tough pitches and headed towards the last few climbs o the course. At the climb before Marine Core hill I was infront and stayed infront until we got to the top of Marine Core where he passed me really quick before going into the final decent. He got a little bit of a gap on the decent and by the time we got to the finishing stretch he was just a little too far for me to sprint past. I ended the day in eighth place which I was happy with due to not feeling good that morning. Looking forward to later in the season, this weekend was super important because it would give us call ups for nationals and be a determining factor in our placement. The SoCal Devo team all arrived at coach Jason's trailer at 7:00 in the morning to do team stretches. We stretched for about 25-30 minutes and then realized that we didn't have too long before we started. We got all our gear together and started our warm up. When we arrived at the line there was a tone of people lined up in our group. I was racing the 17-18 category but I also went off with the 15-16 and 19-29 groups so it was a very large wave of riders. I ended up lining up in the very back with only a few guys behind me. I knew that I needed to make my way through the group as fast as possible. I made a couple of good passes and got ahead of a few guys but was still 15 to 20 riders back. I locked bars with 2 people in the start just because there was so many of us and there was no room on the road. Once we were in the first singletrack everyone held their place until we got to another fire road. Every chance I got I would try to gain a few places just to get a little bit closer to the front. The group stayed together for the most part, for the first two laps. Any time a gap would form between two riders the other riders in the back would get around the one that was slowing down and they would push him off the back. At this point in the race, one of my SoCal Devo teammates, Adin Papell, was right behind me. The second lap was where the front of the pack made there attack and me, not making up enough places couldn't react to there attack because I was too far back. Now Adin and I were working together making up places in the race. By the end middle of the lap though he fell off my wheel leaving me alone to chase people down. I caught a few adults from the other groups and worked with them for a small amount of time until they couldn't hold my wheel. At the start of the third lap, I was all by my self with a few people just barely out for sight. 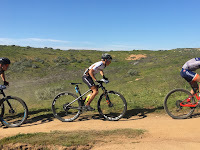 I was about a third of the way done with the lap going up a fire road when I looked back and saw four or five guys from the endurance category along with another one of my teammate, Hunter Zubick, on the back of their group. I still had a decent gap on them but I knew they would catch me eventually. I got into the decent and to the bottom and they caught me on the next climb. We all stayed together and Hunter and I were trying to hang on as long as we could so we could use them to bring us back to the front of our group. The fourth lap started and I was still feeling really fresh and good to go. We were about a fourth of the way done with the lap when one of the endurance riders in the front of our group messed up going up a technical climb and everyone behind him, including Hunter and I, all had to get off our bikes and run past him. The riders that managed to be in front of him took off and got a huge gap while we were all trying to get on our bikes. 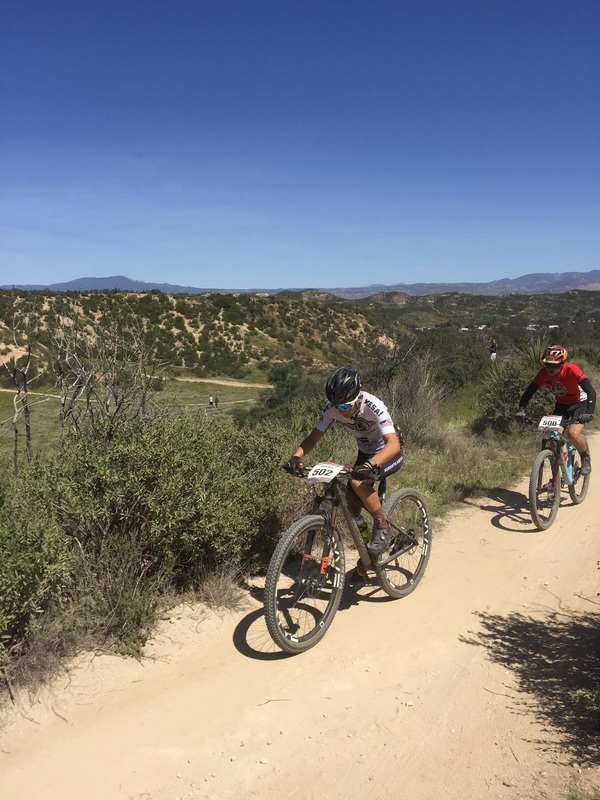 I was right behind Hunter going up the next long fire road and we went right around the other endurance racers and started pacelining with one of them for the whole climb. As soon as we hit the single track though, Hunter And I left the other rider that was with us and took off down the descent. Unfortunately, halfway down my right clip I could fell was loose and I was worried that if I pulled up too hard that my foot would fly off the peddle leaving me no way to clip back in. This was in the back of my head the whole rest of the race and because of that I didn't lay down a big attack to pass Hunter, I was hoping I could save it till the end. It didn't end up working out that way and he went on the climb but didn't get too much of a gap because I definitely hadn't given up. Those few seconds gave him the little edge in the finishing stretch that I couldn't come past him. Little did we know we were fighting for first and second the whole time and I got second. We thought we were mid-pack because of all the other rider in front of us but turns out they were all in different categories. My first SoCal Devo race of the year was awesome and was only possible because of my amazing sponsors including our new kit sponsor Canari. Thanks to Ellsworth bikes, Rudy Project, Kenda tires, ESI grips, Phyisiophix, Scicon bags, Gup industries, and Dryve wheels. Even though it was my second race in varsity the nerves were still at large as if it was my first. Among sorting through the butterflies in my stomach and the pressure I was putting on my self to do better this race, I had to get my head in the game and get in my zone because this was happening, whether I liked it, or not. I was feeling super excited for this weekend because it is at Vail Lake which is my home course and I know it really well. After the pre-ride on Saturday, I wiped down my bike and made sure it was running smooth. Later that night all the Devo team met coach Jason at his campsite to go over the plan for the weekend and to give us some new gear for the year. (Devo kit release coming soon, Made by Canari). It was about 11:30 race day morning and I had 2 hours till my race went off when I got all my feed bottles with physiophix and nutrition ready. By 12:20 I had all my new top of the line awesome Rudy Project gear on and I was getting on my Ellsworth to ride over to the pits to warm up. Once I got over to the pits I walked a short distance over to the feed zone to give them my bottles. After that, I was on the bike for my warm up and soon after that I was at the line waiting to be called up. I had the last call up in the varsity field and lined up in the second row. Once at the line, we waited there for about 10 minutes before the race actually started. Go!! I stomped on my right pedal while trying to clip in my left foot and it took me way too long. By the time I was clipping in half the field that was behind me was now in front of me. I got clipped in and knew that I needed to get to the first single track in the top 5. I made a big effort to get back up there because I knew it was now or never. I got to the top 5 working my way through traffic and was in 5th before we go to the first single track. I got through there without losing a spot and made it into the tighter section in the same good position. Now making our way up the fire road climb we were all trying to get into a draft. I kept my 4-5th position and no one attacked going into the single track so I stayed where I was. We came out of the decent right through the next part of the course with a ton of speed into a momentum climb called air force. For this climb, it is imperative that you are in the right gear and this first lap I just so happened to be in too hard of a gear. I got to the top of the climb and tried to pedal and my foot flew out of my pedal. I had to get off my bike, losing at least 10 spots that I had to make up. After that the next road took us to a steep climb and right to a chattery, switchback descent. The next section of the course we had the option to go left or right. The right was easier but much longer while the left was harder yet shorter. Every lap varsity went left because it was faster, and from there we went right into a pump track in front of the venue and announcer. The whole group was still together as we made the last turn and headed to the finish. By the time we started the second lap I was in about 7-8th place and was trying to get settled back on the group. I took my feed extremely fast and didn't take my second bottle at the end so that I could gain a few spots in the pack. 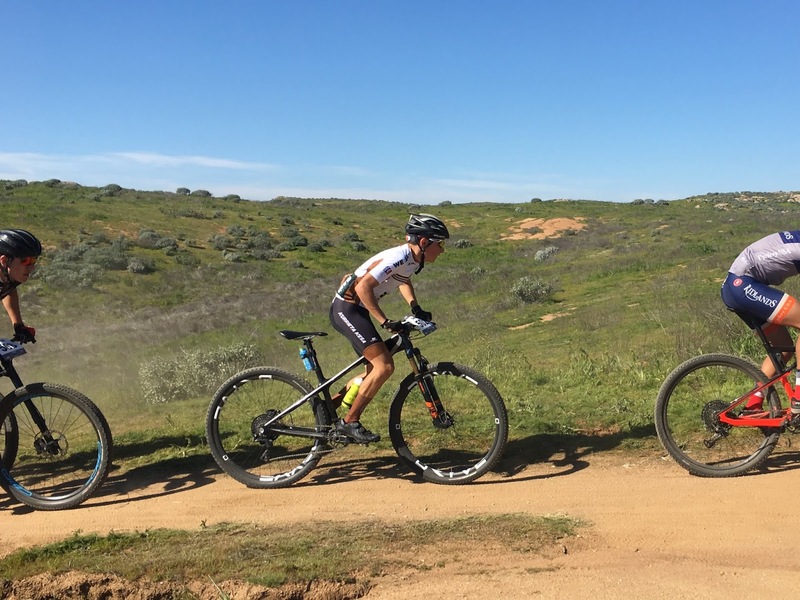 I was trying to recover when at the front of the group, as soon as we hit the first steep climb in that single track, two guys took off. Me, being too far back to react, I had to let a few of them go. From there on out the whole varsity pack was splintered into groups no bigger than three people. Me and two other people were working together to catch two people ahead of us that were too far apart to be working together. The rider that was in the front sat up and let the other person catch him so they could work together. It was much harder to catch them after they came together but we ended up catching them after one of them blew up at the beginning of the third lap. The third lap we added one person to our group and lost one other and the three of us that were left all knew each other because of previous years of racing. We decided to work together to catch other riders and keep other ones off of our group. We stayed together taking turns pulling and worked together really well for the rest of the lap. By the time we came around for the final lap, it was getting really fast and harder to hold on. I didn't take too many pulls that lap because my fellow riders realized I was having a hard time holding on and wanted to keep me with them so I wouldn't work with the person behind us at the time and catch them. Every time a small gap formed between us I told my self that all I had to do was catch back up and I'd be able to catch my breath and if I was to fall off now there was a larger chance that I would be caught from behind. So with all my effort every time I would bridge the gap back up to them because I knew how important it was. I held on right till the end and fell off the back for the last about three minutes of the race. I was able to fend off the rider behind me to put my best varsity finish so far in the books with sixth place. I can't end my blog without giving a big thanks to Kenda tires for the new tires I put on a few days before the race. My tires never lost their grips and they are truly an awesome product for racing. Once again My Ellsworth bike never fails to deliver and has made this result possible. Thanks to Phyisiophix for the nutrition keeping me going during the race and training. Thanks to Rudy Project for the awesome protection with there helmets and glasses. Thanks to ESI for the super comfortable grips that take away the brake bumps. Thanks to Dryve wheels for the amazing support and products they have provided me. Thanks to Gup industries and Scicon bags for their support with their products. 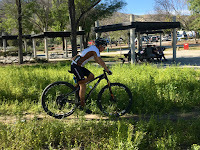 Don't forget to go check out my teamates blogs at the SoCal Devo website. All you have to do is click on the riders name. Varsity is intimidating, to say the least. Watching my brother race varsity last year was fun but it is totally different when you are in the race and are racing some of these big names. I got a last row start since I missed the last call up by one point. My coaches and I had already talked about a strategy for the start just in case I ended up in the back, which I did. The start of Lake Parris is different than all the other starts of the season because you stage in one place, then role a little ways up the road to the actual start line where the race starts. Once the race started and the director of the SoCal league whispered go, I quickly placed my self into the top 10. While trying to get there I spent way too much time trying to clip into my peddle making me even more nervous. As soon as we hit the dirt the pace immediately picked up and then it really started to feel like a varsity race. By the time we got to the top of the climb, the group had gotten a little spaced out and there were a few people out in front and a few of us a little ways back. Once at the bottom of the descent we started the long, flat and very windy fire road making our way towards the lake. This is where the groups came back together and worked together in the wind. Everyone in the group wanted to be behind someone so that they didn't have to push the wind. We went through the feed zone where I successfully grabbed my bottle from the best feeder out there, Coach Heather Ranoa and went straight through to the finish line to complete my first lap. Lap two was a little more difficult in the sense that people started to attack more and more. By the time we got to the top of the climb this time the group was totally split up with a group of 4 with a considerable gap to the rest of us going into the decent. I was all by my self when I got to the bottom of the decent with two guys just barely up the road from me and the leading group of 4 guys a little bit more ahead of them. Pushing my own wind now with 2 guys working together in front of me I knew I needed to give it what I had to catch up to them so I could stop working so hard. I caught up to them about midway through the long straight away and told them we needed to work together to catch the group in front of us. We came through to finish our second lap all 3 together and still yet to catch the lead guys. Going into lap 3 I had no idea how many people were in the leading group so I had no idea what place I was fighting for until one of the people on the sideline told us we were in 5th, 6th, and 7th place. This got me really excited with the idea that I might be able to make it onto the podium in my first varsity race. By the middle of the climb, one of the riders that was with me started to fall off the back. By the top of the climb I was giving it everything I had to not let 5th place drop me as well but I just couldn't hold on. I was hoping since we would both be pushing our own wind that I may be able to catch him on the flats but that didn't happen. At this point, I'm in no man's land, with riders out in front of me and others behind me both too far for me to work with. I finished the third lap all by my self, pushing wind and burning matches just hoping that something good was going to happen or that I would stay there the rest of the race. At the beginning of the last lap I got onto the road and looked back to see if anyone was there and saw no one so I settled into my pace. when I was about one-fourth of the way up the climb I looked back again and saw a group of 4 working together to catch me. I also saw the 5th place rider way up ahead of me and I decided that he was too far for me to catch alone and I couldn't hold off a group of 4 forever so I backed off a bit and got a little rest before the group of 4 caught me. I knew that they would catch me eventually so I let them catch me when I still had matches to burn rather than later when I was totally blown up. Once they caught me I finally got a break from the wind because I had been by my self in the wind for a full lap. The rest of that lap was extremely fast and coming into the finish I was outsprinted and ended up taking 10th. I would like to give a big thanks to all my sponsors who make my racing possible. Dryve wheels, Kenda tires, Ellsworth bikes, ESI grips, Sicion bags, Rudy project, gup industries, and PhysioPhyx. These products all play a huge role in my race day and training. They are truly top of the line products that I would recommend to anyone. 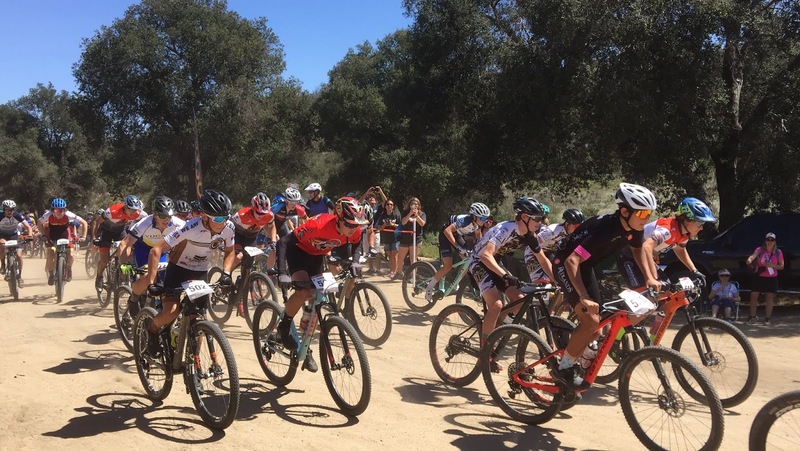 The first race of the 2019 season out at Vail Lake and I'm super stoked to be riding with SoCal Devo again. This time I was racing in the 2 person 6-hour open men category with Adin Papell, another one of my Devo teammates. I started the race for our team and was a couple row back from the front. The thing I don't like about starting in a race like that is there are so many people racing to be at the front and you want to be sure you are going to get a good spot heading into the single track. Everyone is wheel to wheel, handlebar bar to handlebar trying to get the best line and get to the front more. By the time the parade lap was over and we were out on course we were all spread out and I was in the top 10. The first lap was really fast, way faster than I was expecting and by the time I came around finishing my first lap I was spent. I handed the baton to my teammate Adin hoping that he was feeling good. Sitting there for only 35-40 minutes I saw that Adin was just about to come through to finish our team's second lap. I got ready really quick and jumped on the bike for lap number 2 for me. During this lap, I was feeling super strong and was passing people left and right. I was sure that this lap was going to be my fastest lap, and it was. Even at the end of the lap, I was still feeling strong. I passed the baton to Adin and watched him take off. I went into the pit and got hydrated and got something to eat. After waiting a while I saw Adin going up the trail right behind the timing tent which from there takes about 10 minutes to finish the rest of the lap. I got all my Rudy Project gear back on and started to warm up a bit before going out on my third lap. I started out a little slow on lap three going into the first single track but by the end, I was feeling fast again. Traffic at this point on the trails was spread out along the whole course and there was always someone on the trails just a little ways ahead so you always have someone to chase. Personally, I like the middle section of the course the most. It is more fun than any other part of the course but the course as a whole is really fun and a good course for this type of racing. After finishing lap 3 I found out that we were 45 seconds behind fourth place and I was driven to catch them. Adin Came threw on his third lap and totally cramped up right before he got to me. I took the baton from him and got into my zone to try to catch fourth place. I ended up catching him in the middle of the lap and I knew that I needed to give Adin a little bit of a gap to play with going into the next lap. I came through and gave him about a minute gap on the team I had just passed and by the time he came through again the gap was even bigger. My last lap, lap 5, I gave it everything I had left in me because I knew it would be my team's last lap. I tried to pass as many people as possible hoping that they were in my category. In the end, none of them were in my category and we ended up holding on to fourth place. A new year means new opportunities and another chance to better yourself as a rider and more importantly to better yourself as a person. I was super excited for this years SoCal Devo boot camp because we had a lot of new and old members on the team. Every rider is fast and deserves to be on this team and it makes me feel privileged to be a part of this amazing opportunity. This year we had a few hard intervals and time trials on the bikes with a little bit of fun riding and skills training in the rain. Back at the house, we had some serious talks about sponsors, training, and nutrition while also doing team bonding activities. Day one everyone arrived at coach Brian's house at 5:00pm and got all set up for the weekend. We had so many Ellsworth bikes in the garage it was hard to walk around in there. Once everyone got settled in coach Jason started to pass out all the new years swag from our sponsors. For new members of the team, coach Jason gave them their Scicon Race Rain bag while past members had them from the previous year. I highly recommend this bag to any elite racer out there. It is so organized and the most amazing bike bag I have ever owned. This year the whole team was equipped with a new windmax helmet and trailyx glasses from Rudy Project. We were each also given 2 sets of ESI grips along with a pair of Kenda tires. Me personally I was given the Honey Badger xc pro and the Saber pro to run on my Ellsworth bike. After that was all over we played some card games and hit the racks for bed. The next morning we got up at about 7:00am, ate breakfast and started to get ready for our first ride of the day out at Vail Lake. We packed up the cars and headed out hoping that the rain would stay away. The first thing on the agenda at Vail was to do a timed race up to the top of the dam climb which took us about 9 and a half to 12 minutes after our warm up. We decent down one of the more fun and technical trails called Matco over to the venue area for a few laps of the boogaloo course at race pace. From there we went to the jumpline trail to practice skills in the turns. Now with it slightly raining on us we made our way over to a climb called burning calves. The name is very fitting and the climb is very technical. Coach Brian and I were the only ones to make it up the climb without putting our foot down because it was so steep and slippery. Once we had finished there we went to coach Jason's trailer for lunch and due to the rain ended up going back to coach Brian's house for a very difficult trainer ride and skills talk. after dinner, we had a few lectures on training, uploading, nutrition, and social media. As soon as the talks were over all the team including coaches got all excited to watch Supercross. Day 2 came along and we were back at it again with breakfast and getting ready for the morning ride. We loaded the cars up and drove up into Lacresta to a hill called Los Gatos. This hill is a paved road that few cars travel, and for good reason because it exceeds 26% in steepness several times. We did a total of 2 intervals up this less than a mile long climb and got over 1,500 feet of climbing. Going down this hill both times we hit over 55mph on our hardtails. 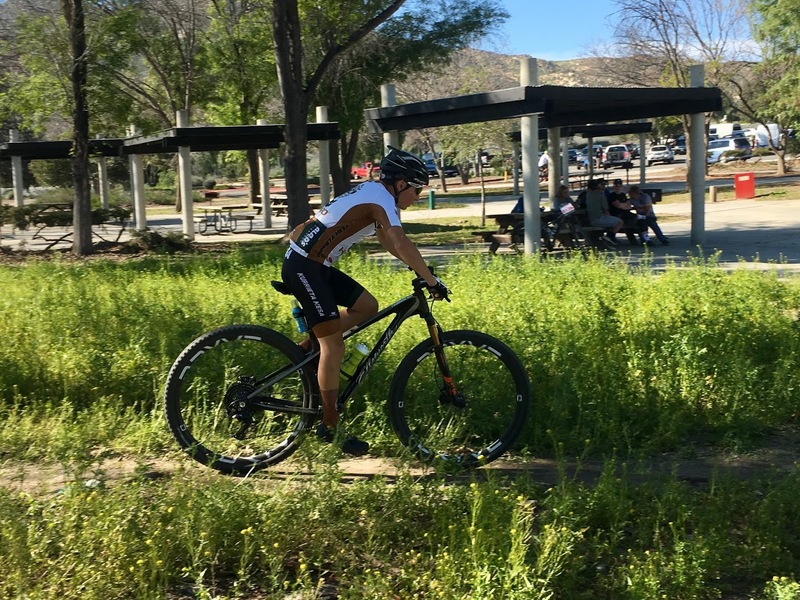 After those grueling intervals, we went and got pizza as a team before going to a local trail system called x-trails in Temecula. We road for an hour and a half of tight switchbacks and technical trails before calling it a day and heading back to coach Brian's house to pack up and head our separate ways. I would like to thank all our supporting sponsors of the Devo team, coaches and my teammates for making this years boot camp so much fun. I'm looking forward to this year of racing and new opportunities with everyone.